NBA 2K9 is a basketball simulation video game developed by Visual Concepts and published by 2K Sports. It is the tenth installment in the NBA 2K franchise and the successor to NBA 2K8. It was released in 2008 for PlayStation 2, PlayStation 3, Xbox 360, and Microsoft Windows. Kevin Garnett is the cover athlete of the game. NBA 2K9 is the predecessor to NBA 2K10 in the NBA 2K series. Like past games in the series, NBA 2K9 simulates the experience of the sport of basketball, and more specifically, the National Basketball Association. Players play NBA games with any team of their choosing, and may customize many different aspects to alter the play style and overall presentation. Several single- and multiplayer game modes are present, including season, online, and quick play, as well as the ability to create new teams and players. NBA 2K9 received positive reviews from critics upon release. Most positive comments were concerning the overall gameplay, and the aesthetical presentation; some called NBA 2K9 the "best basketball game around". Some criticism was directed at the game for what some saw as having a lack of new features. By July 2009, the game had sold over 2 million copies. NBA 2K9 is a basketball simulation video game based on the National Basketball Association. Like past games in the series, NBA 2K9 simulates the experience of the sport of basketball, and more specifically, the NBA. Players play NBA games with any real life or custom team, and can customize many aspects, such as camera angles, the presentation of players, the sound levels, and the level of realism. Several different game modes are present, such as Association 2.0 (a season mode), 5-on-5 online multiplayer, mini games, and quick games of varying levels of competition. Like other NBA 2K games, NBA 2K9 is marketed as being as realistic as the actual NBA, with all the things featured in NBA games, such as commentary, halftime shows, replays, crowds, and real player movement, among many other things. Another feature heavily touted before release was the game's HD visuals, which was said to have been "drastically improved". Kevin Harlan and Clark Kellogg are the commentators with Cheryl Miller being a sideline reporter. Kevin Garnett is the cover athlete of the game. NBA 2K9's soundtrack consists of 24 licensed songs as well as one original song. The game was released worldwide in 2008 for PlayStation 2, PlayStation 3, Xbox 360, and Windows. NBA 2K9 is the first game in the NBA 2K series to be released on PC. NBA 2K9 received "favorable" reviews on all platforms except the PlayStation 2 version, which received "average" reviews, according to the review aggregation website Metacritic. In Japan, Famitsu gave it a score of three sevens and one six for the PlayStation 3 and Xbox 360 versions; and two sixes, one seven, and one five for the PlayStation 2 version. David Ellis of 1UP.com particularly praised the customization aspects of the PS3 and Xbox 360 versions and the levels of realism, but disliked the unnecessarily complicated control scheme. Ellis also spoke positively of the online modes and the Living Rosters feature. Ellis summed up his review by stating: "The NBA 2K9 team has refined last year's game and added several new features that change the way videogame basketball is played. While it's not perfect, 2K9's certainly headed toward another title run." Matt Bertz of Game Informer said that the concepts of the same console versions "continue to refine [the series] with the deepest franchise mode in any sports game", called the crowd animations "amazing", liked the broadcast team, complimented most aspects of the controls, and said the game is "the best basketball game around for hoops aficionados". Bertz stated: "With its realistic animations, solid controls, and ambitious Association mode, NBA 2K9 makes its title run once again. But the competition is stiffening, and next year needs to bring significant leaps forward with online play and the low-post game if 2K wants to make it 10 in a row." Aaron Thomas of GameSpot praised the "Living Rosters", "excellent" gameplay, and the presentation of the PS3 and Xbox 360 versions. Thomas said: "It's disappointing that there aren't more noteworthy additions to this year's game. Living rosters and five-on-five play are nice, but their appeal is limited. That said, there's very little not to like about NBA 2K9. Player animations are outstanding, Association mode is deep, online options are plentiful, and the gameplay is terrific. If you're a baller, this is the game for you." IGN's Nate Ahearn said of the PC, PS3 and Xbox 360 versions: "NBA 2K9 is [a] basketball game for the purists out there and has plenty for diehard basketball fans to enjoy. At a price of $19.99 I can almost forgive the absence of multiplayer, especially when you consider how much game there is still is to play. There are tidbits built in to appease casual fans, but theres no question that with things like Bird Years making their way into this years game that 2K9 is made for aficionados. Even still, anyone who has seen a pro game will be able to find the similarities and the finite details that make NBA 2K9 the best game in town." GameTrailers complimented the PS3 version's overall presentation, crowd animations, overall gameplay, and CPU, but disliked the game's lack of an identity, the menu designs, commentary, online technical issues, and the introduction of some "silly" features. The review stated: "The NBA 2K series has seen modest improvements since NBA 2K7, primarily due to the level of quality achieved at such an early phase in the next-gen life cycle. Because of this, casual hoops players aren't going to be wowed with this latest iteration of NBA 2K9, but it's meant to satisfy those who live and breathe basketball, as the improvements in the AI and atmosphere alone are sure to tickle the inner twine of dedicated fans." By July 2009, NBA 2K9 had sold over 2 million copies across all platforms. ↑ Ahearn, Nate (September 23, 2008). "NBA 2K9 Multiplayer Hands-on". IGN. Retrieved August 10, 2015. ↑ "NBA 2K9 - Xbox 360". IGN. Retrieved August 10, 2015. ↑ "NBA 2K9". NBA Australia. Retrieved June 9, 2015. ↑ Sarkar, Samit (June 6, 2008). 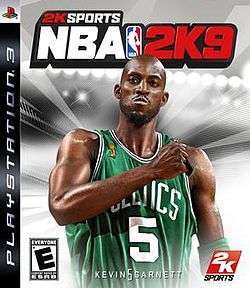 "Celtics' Kevin Garnett named NBA 2K9 cover athlete". Destructoid. Retrieved August 7, 2015. ↑ IGN Music (October 6, 2008). "NBA 2K9 Soundtrack Revealed". IGN. Retrieved June 9, 2015. ↑ Sines, Shawn (June 10, 2008). "NBA 2K9 Soundtrack Revealed". 1UP.com. Retrieved October 26, 2015. ↑ Sarkar, Samit (July 10, 2008). "NBA 2K9's Living Rosters and release date(s)". Destructoid. Retrieved August 8, 2015. 1 2 3 4 "Famitsu Info 18 May 2009". NeoGAF. March 17, 2009. Retrieved May 7, 2016. 1 2 3 Bertz, Matt (November 2008). "NBA 2K9 (PS3, X360): 2K's Latest Basketball Sim Is Dunkadelic". Game Informer (187). Retrieved May 7, 2016. 1 2 3 Thomas, Aaron (October 8, 2008). "NBA 2K9 Review (PS3, X360)". GameSpot. Retrieved May 7, 2016. 1 2 Berman, Steve (October 15, 2008). "GameSpy: NBA 2K9 (PS3, X360)". GameSpy. Retrieved May 7, 2016. 1 2 "NBA 2K9 Review (PS3)". GameTrailers. October 16, 2008. Archived from the original on October 23, 2008. Retrieved May 7, 2016. ↑ Grabowski, Dakota (October 15, 2008). "NBA 2K9 - 360 - Review". GameZone. Archived from the original on December 16, 2008. Retrieved May 7, 2016. 1 2 Ahearn, Nate (November 19, 2008). "NBA 2K9 Review (PC)". IGN. Retrieved May 7, 2016. ↑ Ahearn, Nate (November 12, 2008). "NBA 2K8 Review (PS2)". IGN. Retrieved May 7, 2016. 1 2 3 Ahearn, Nate (October 6, 2008). "NBA 2K9 Review (PS3, X360)". IGN. Retrieved May 7, 2016. ↑ Lahti, Evan (December 2008). "NBA 2K9". Official Xbox Magazine. Archived from the original on October 10, 2008. Retrieved May 7, 2016. ↑ "NBA 2K9". PC Gamer UK: 91. January 2009. ↑ "Review: NBA 2K9 (PS3)". PlayStation: The Official Magazine: 94. December 2008. ↑ Robbins, Drew (October 30, 2008). "NBA 2K9 (PS3) Review". 411Mania. Retrieved May 7, 2016. 1 2 "NBA 2K9 for PC Reviews". Metacritic. Retrieved June 11, 2015. 1 2 "NBA 2K9 for PlayStation 2 Reviews". Metacritic. Retrieved May 7, 2016. 1 2 "NBA 2K9 for PlayStation 3 Reviews". Metacritic. Retrieved June 11, 2015. 1 2 "NBA 2K9 for Xbox 360 Reviews". Metacritic. Retrieved June 11, 2015. ↑ Ellis, David (October 7, 2008). "NBA 2K9 Review (PS3, XBOX 360)". 1UP.com. Retrieved September 18, 2015. ↑ Brice, Kath (July 2, 2009). "NBA 2K9 reaches 2 million sales worldwide". GamesIndustry.biz. Retrieved June 11, 2015.